The region of Kentucky west of the Tennessee River is known as the Jackson Purchase, named because of Andrew Jackson's critical role in its acquisition. The Jackson Purchase area was secured in 1818 by a treaty with the Chickasaws who at that time occupied the land. Today it includes Kentucky's eight westernmost counties: Hickman, Calloway, Graves, McCracken, Marshall, Ballard, Fulton and Carlisle. The purchase was primarily negotiated by two agents of the United States: General Andrew Jackson, a Revolutionary War hero who later became our seventh President, and Isaac Shelby, the first and fifth Governor of Kentucky. The Andrew Jackson Room is decorated in a dark red color similar to the inside of his cloak shown in one of his most famous portraits. The portraits on the south wall are of Andrew and his beloved wife, Rachel. The "D" on the white cotton wall hanging represents Donelson, Rachel's maiden name. The picture above the bed is thought to be a presidential portrait of Andrew Jackson astride his prized white horse "Sam Patch". The picture on the west wall shows a map of the Jackson Purchase area, the White House and the magnolia tree that Andrew Jackson planted in 1830 as a memorial to his wife Rachel, and a copy of the last known portrait of Andrew Jackson. 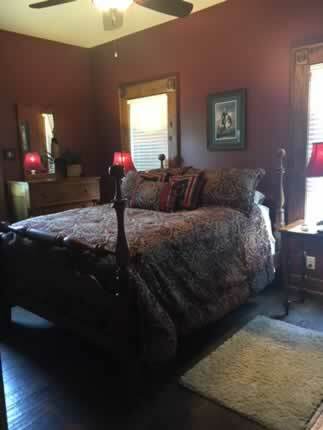 $90 per night ~ Cozy, smaller upstairs room has queen bed, TV, private bathroom and shower just outside the door.